Fire safety fun for wee ones! 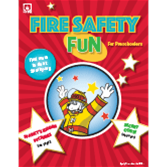 Start tiny tot learners off right with the colorful and captivating Fire Safety Fun for Preschoolers! As they dive into age-appropriate activities in this coloring and activity book that's bursting with brilliant eye-catching photos and colorful illustrations, they'll learn great information about staying safe and protected from fire.